Following on from my previous post with a few first impressions of certain Spring 2011 looks, here are a few more individual looks that I found interesting. After I am finished with Milan, I may just do a proper review or two of Parisian shows, provided there are entire collections that pique my interest. Although there is a single collection from Milan that I am rather keen to review, I would prefer to give myself some time to consider it fully. However do expect that review in the near future. I am a huge fan of chunky Spring knitwear as I would far rather leave my jacket at home and simply chuck on a nice sweater. I was particularly drawn to the texture and simplicity of this sweater, which is actually thinner than it potentially looks. I enjoyed the styling with the pushed up sleeves exposing full length shirt sleeves, and the wider neck. The pulled up sleeves provided an additional sense of visual depth, and played rather nicely against the elasticated ankles of the trousers. 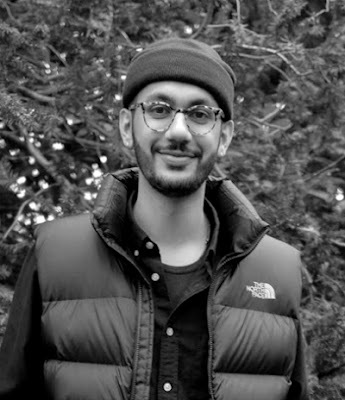 I have never really been one to wear crew neck sweaters with shirts, however the collarless option and slightly rumpled fabric certainly made it look appealing. 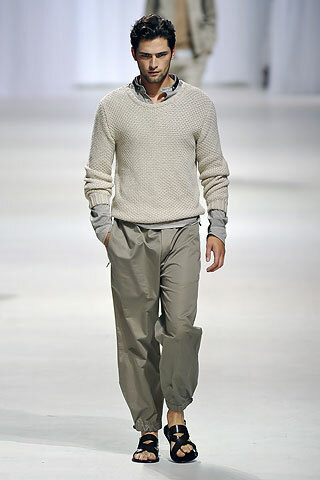 The touch of sportswear provided by the trousers was an interesting direction, and gave the casual look a more youthful finish. Personally I was not a fan of the footwear choice, I would have preferred some tan brogues with Vibram Christy soles, but there we are. I loved this look. The jacket and trouser combination could have come off far too tracksuit-esque, but the leather trim detailing and cut of the jacket gave it a smarter edge. The collarless and untucked blue shirt was cut rather short, but I think it worked well, especially as it barely peeked out from beneath the fine gauge sweater. 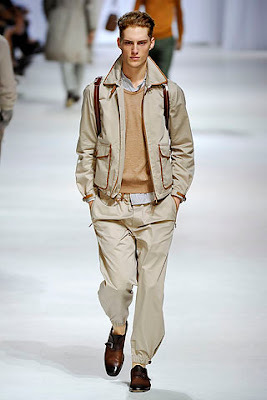 Again I enjoyed the elasticated trousers, particularly having been paired with the monk strap shoes. I think the play with more refined sportswear was intriguing, especially considering the decision to finish the look with a leather strapped backpack. Armani's tailoring has left me somewhat confused as of late, it seems to have lacked a definitive direction. However I think the decision to offer fitted jackets with strong shoulders and relatively slimmer cut trousers was a good one. I feel the cut works successfully in this look, with the barely double breasted jacket providing a nice cinch to balance out the strong shoulders and sharply cut away front. 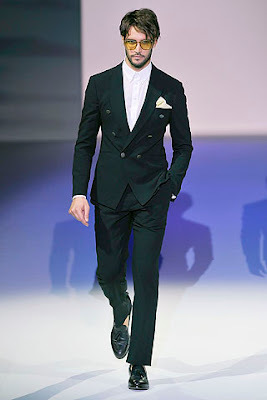 I think the wider lapels certainly helped the look, as a thinner alternative would have felt odd against such obvious emphasis on a broader chest. The button placement is interesting to consider, with the topmost buttons hitting squarely around the breast pocket region. Indeed all three sets of buttons appear to sit above (even if just barely where the bottom buttons are concerned) the waistline providing the illusion of longer legs. Couple this rather basic tailoring illusion (the collective term for tailors is after all a disguisery of tailors) with the slightly higher hems on the trousers, and the minimal flaring of the jacket at the hips, and the silhouette is one of broad shoulders and chest tapering downwards. Armani may have come a long way from his power suits, but it is nice to see suits following the inverted V, even if it be subtle. Chunky knitwear + brown leather shoes with white soles? Sign me up. Luxury is perhaps a relative term, but the Haider Ackermann collection oozed luxury and opulence. 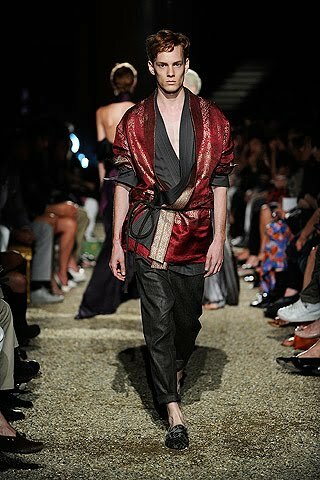 Perhaps more an evening look than an everyday look, I loved the loose and open layering. Shape was provided by the rolled sleeves, braided rope belt and tapered trousers. Looks like this make me wish I lived further East. I would lounge after dinner in a room opening out into the night sky, with layers of tulle and brocaded raw silk draped elegantly around, and the smell of sweet mint mingling seductively with cinnamon and orange, all accompanied by good conversation...and perhaps just a cat or two slinking around my ankles. I may rock bow ties and silk neckerchiefs rather often, but there is actually a sneakerhead and sportswear fan knocking around that gets the occasional outburst. 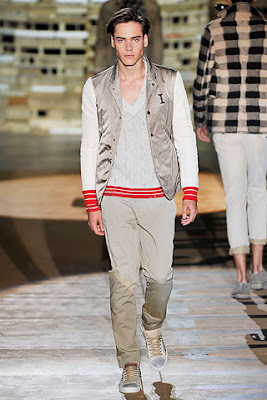 I really liked this look, especially the refined varsity jacket. Note the revers pressed to evoke the lapels of a blazer and the fact that it is merely the cuffs that are elasticated. The matching of the cuffs to the waist trim of the cable knit sweater was also a nice touch. The trousers were simple but functional, and I was rather drawn towards the Lanvin-esque sneakers. I far prefer this style of sneaker to the more, shall we say, European style of the usual Jil Sander or Dior Homme (the latest Kris Van Assche designs notwithstanding) offerings. Personally I would love to wear this outfit with the metallic Raf Simons astronaut sneakers. I love the second and fourth look! I wish all men dressed like this! you are so far ahead of me, but I did find some khakis I could roll up. 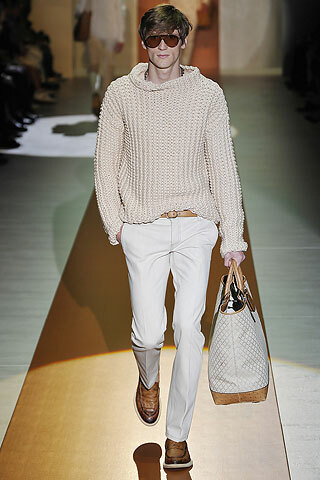 Definitely down with the white-soled Guccis...and Iceberg has impressed me. The last I heard of Iceberg was the goofy t-shirts with the cartoon characters on them. [url=http://hairtyson.com]Phen375[/url] are tablets that resist reduce body weight. One of these tabs has to be enchanted with ring false, around 20 minutes ahead of a collation, twice a day.